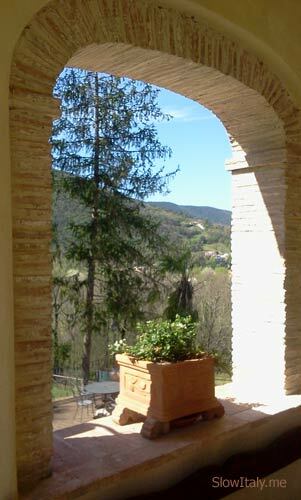 Relais Castelluccio Palusse, Città della Pieve. 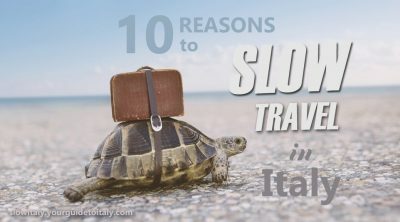 Photo: Slow Italy. 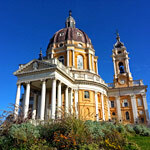 This article is a summary of our several recent trips to Umbria. We have stayed in different places and from those have selected our top 5 favorite country B&Bs for you. 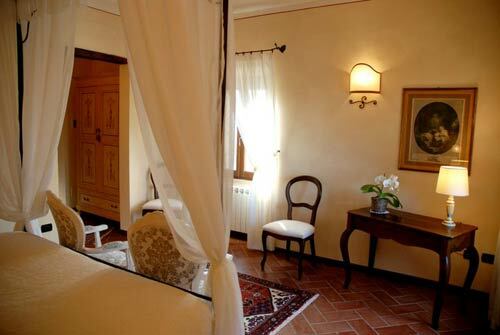 Actually, the term ‘B&B’ is an understatement to qualify these typical Umbrian relais. 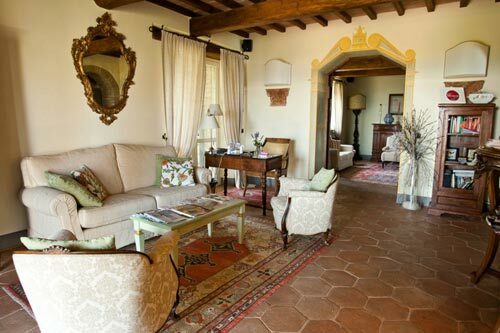 Set in an old Umbrian farmhouse, restored historic mansion or castle, they are the kind of places where you feel immediately at home, as if you were staying at a relative’s place while being spoiled by your dolce zia or zio. All of these country houses have in common that they are family-owned and owner managed, which vouches for genuine quality and exceptional hospitality. The family also lives on the premises, which is an additional guarantee for customer care and excellent service. All of them are very small structures, with less than 10 rooms, operating without external staff (except for cleaning, and, in some cases, kitchen help and serving). This means that all contact with the country relais, from the moment you book, to the moment you are shown to your room and served at dinner, is done by the owners themselves, which guarantees a high commitment to satisfy you as a guest. As opposed to a ‘traditional’ B&B they also all (except Torre Palombara) offer the possibility to dine on the premises in a table d’hôte format, usually with a set menu. 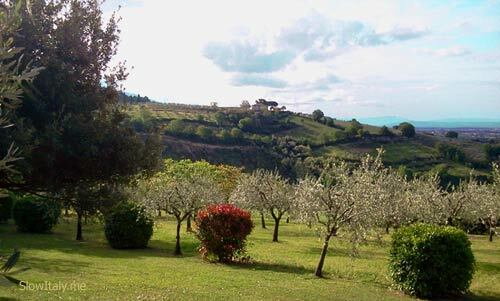 Most of the food products served (such as olive oil, fruit jams, vegetables) are also grown on the property itself or stem from local produce (or…from the owner’s vineyards). However, what makes these country B&Bs really stand out from the others is that their owners are really passionate about what they do. The passion they have for their region is infectious and truly inspiring. Most of them have been in the area for years, some even for centuries (!) and they are all very knowledgeable about their region. Whether it is for buying local wine, finding that authentic, little restaurant or getting directions to organize a day trip, you can always be sure that you will get first-rate insider information from your hosts. In other words, everything we, at Slow Italy, love. 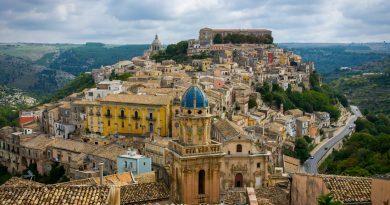 All five are also ideally located as a base point to explore the idyllic country scene and visit the beautiful little Umbrian hill towns and historic cities. 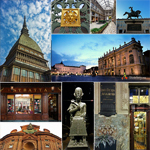 The top 5 does not represent any particular ranking, as each of these country houses has something unique to offer that cannot be ranked against other criteria. This country relais is superlative in many ways. The first striking thing about this place, besides the stunning views and beautiful property, is how truly friendly and welcoming the owners are. Paola and Stefano really go out of their way to make your stay unforgettable, anticipating your every demand, without ever being intrusive. They are a very inspiring, interesting and warm couple, who really enjoy what they do and are really committed to make you feel at home. They have traveled extensively themselves and told us that their motivation was to create a place that would include everything they had themselves appreciated while staying somewhere as a traveler, while adding all those little details that they had themselves found missing when staying in hotels. Well, the result is there: everything has been done to create a very cozy, soothing and relaxing atmosphere, where you feel totally spoiled and taken care of. 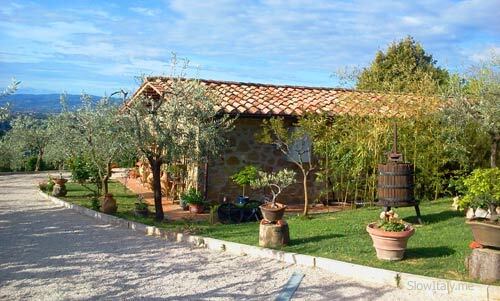 The property spans two hectares of land, with olive groves, wine vineyards and beautiful Mediterranean plants all around the house. I loved going for an early morning stroll through the garden admiring all these colorful plants and flowers, set against the beautiful view of the valley. 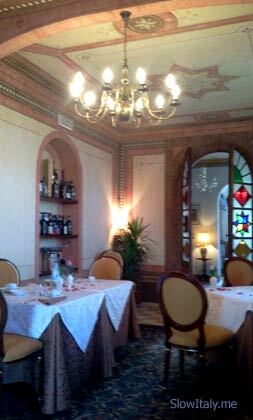 Paola and Stefano did a great work restoring the historic building into a charming and luxury country house. 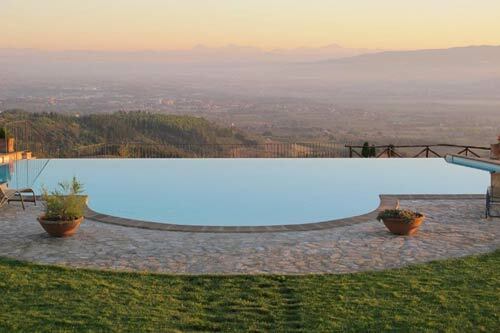 The view you have from the fabulous infinity pool over the Umbrian countryside is really breathtaking. The ideal place to have your evening aperitif relaxing with your family or friends after a day of sightseeing or walking through the neighboring little hill towns. The living spaces are delightfully furnished and decorated, full of interesting details and personality. There are small, cozy sitting places with libraries everywhere, where you can sit down and relax, reading a book. The mix of the antique furniture with these ivory and earthy colors creates a refined and, at the same time, very cozy and laid-back atmosphere. This is the 'reception', or entrance room. At dinner, there is a multiple selection menu, consisting of locally grown, seasonal products wonderfully prepared by Paola. 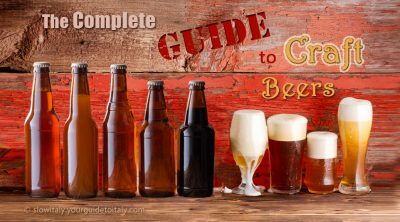 The wine list is impressive and Stefano, who is very knowledgeable about wine, will, with just of few hints from your part, pinpoint exactly which kind of wine will best suit your taste. 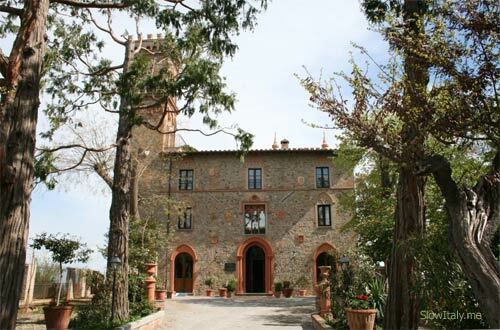 The Palazzetta is also an excellent home base for visiting towns such as Perugia, Spoleto, Todi, Gubbio, Assisi, and charming hill towns such as Montecastello di Vibio and Montefalco. 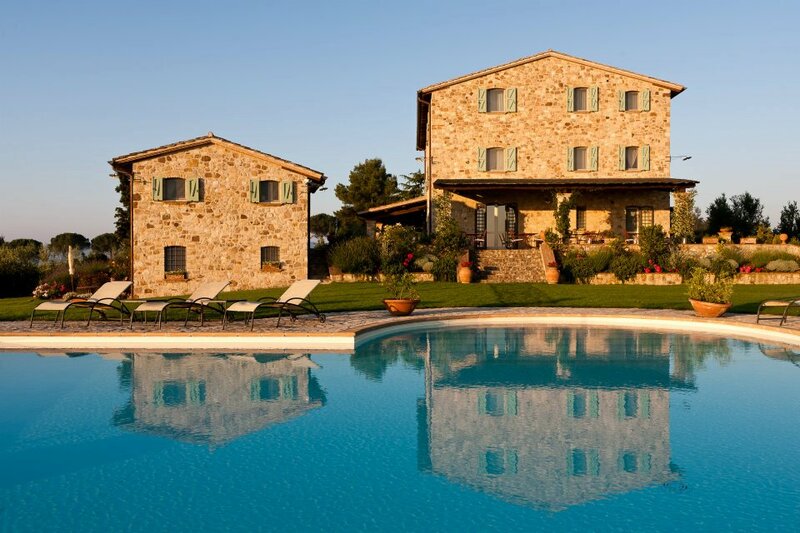 Set in the enchanting hilly surroundings near Assisi, surrounded by olive groves, the farm house dates back to 1179. The pool area is beautiful and relaxing, with lovely potted flowers and plants everywhere, including an impressive bonsai collection, cultivated by the owner herself. View of the swimming-pool. 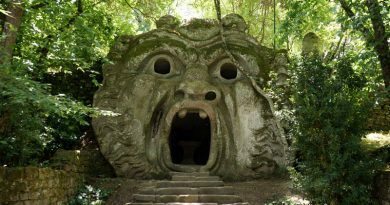 Photo courtesy of Santa Maria degli Ancillotti. 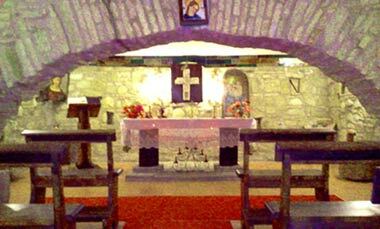 The church under our room. Actually, our room was on the ground floor and the chapel is located below ground level. Dinner is served inside or in the veranda depending on the season. I think it is the Mamma who cooks, while Alessio and his father serve at the tables. Alessio’s father recommended us an excellent, local wine, which fitted perfectly with our dinner. 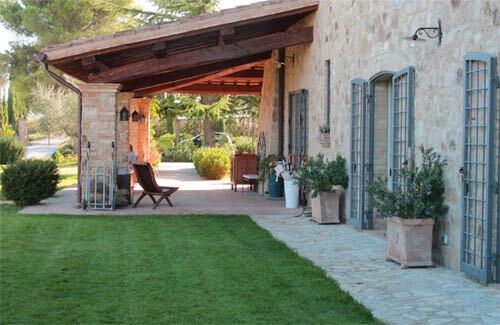 Unlike the other country houses Santa Maria degli Ancillotti is the one B&B that has kept closest to the agriturismo style, even if it has that undefinable touch that differentiates it from most other agritourisms. 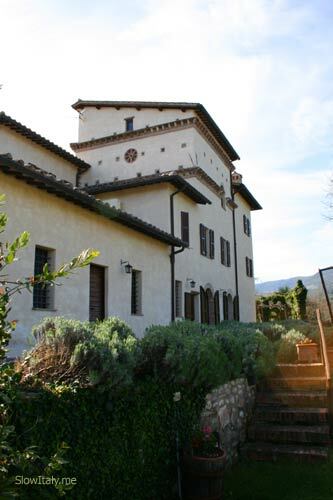 It is ideally located in the countryside, but with Assisi and Perugia nearby. 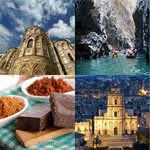 Day excursions are possible to Gubbio and other parts of Umbria. 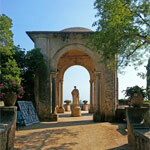 Relais Castellucio Palusse is the spot for a romantic getaway, par excellence. This small, neo-gothic castle has a fascinating and romantic history. The castle belonged to Vittoria Guerrieri, the daughter who King Vittorio Emanuele II’s had with his beloved morganatic wife Bela Rosin. 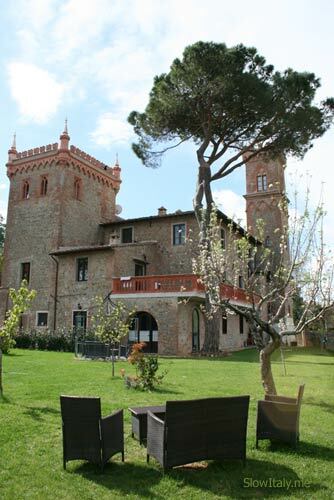 Vittoria had the castle built in 1860 as her love nest for herself and her lover Paolo. Actually, Palusse was the Piedmontese nick name given by Vittoria to her lover Paolo. 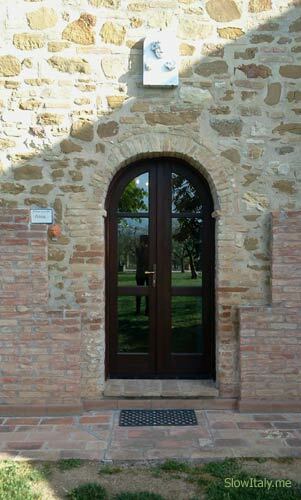 Relais Castelluccio Palusse entrance. Photo: Slow Italy. 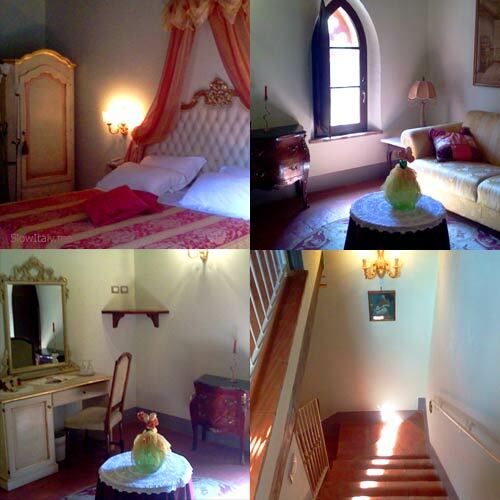 The historic building, including the 1500s tower, has been beautifully restored and refurbished by the current owner, Katia. She is a totally enthusiastic and witty person who always has something interesting to tell. She is originally from Tuscany (the hotel is also located on the frontier between Umbria and Tuscany), but knows the region very well. View from the Wellness center. Photo: Slow Italy. We stayed in the Piedmontese room (‘Piedmontese’ in reference to the origin of the royal family member to whom the building once belonged), which has a separate sitting room that can be converted in a separate sleeping space for a child or third person and a spacious bathroom with (small) jacuzzi. 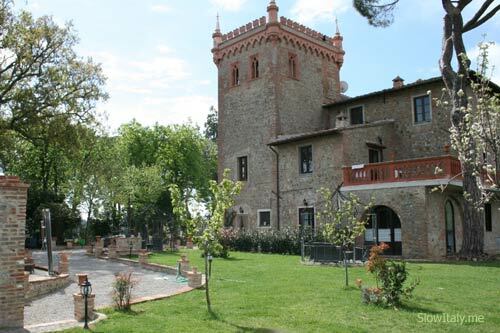 However, if you want to have a totally unique experience we recommend you book the duplex suite in the 1500’s tower, an ancient dove tower that has been beautifully restored and refurbished into a wonderfully romantic room with a private roof access offering views over lake Trasimeno. The duplex suite in the 1500's Tower. Photo: Slow Italy. At dinner a set four-courses-menu is served. 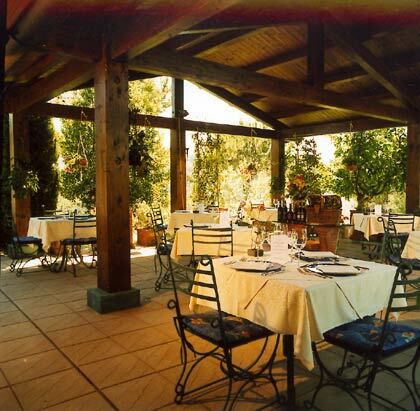 More dining options are available at Città della Pieve, which is within walking distance of the relais. Breakfast and dining room. Photo: Slow Italy. 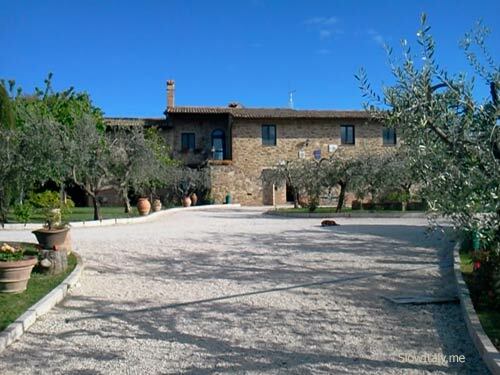 Relais Castelluccio Palusse is ideally situated, at 20 min from Lake Trasimeno, about 40 min from Perugia, 1 hour from Spello. 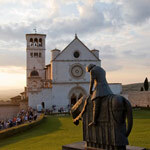 Day excursions are also possible to Gubbio, Todi and Assisi. 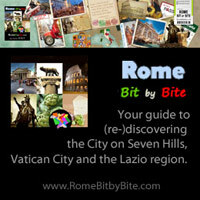 For info about Città della Pieve, see 8 lovely Umbrian hilltop villages. Torre Palombara, Narni. Photo: Slow Italy. 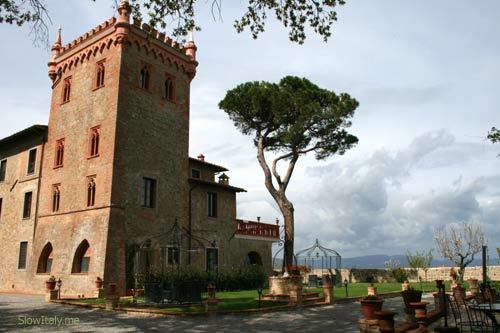 Torre Palombara has been in the same family since the 1500s and was originally built as a `Dove Tower’. In the following centuries the main house was expanded and connected to the existing tower. The owners have been very careful to respect the original structure of the building. 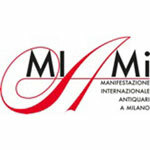 The owner, Leonardo, and his mother are very sweet people who have a real passion for their region. You can tell from the amount of interesting documentation, beautiful books and brochures and insider tips they have to share with you. 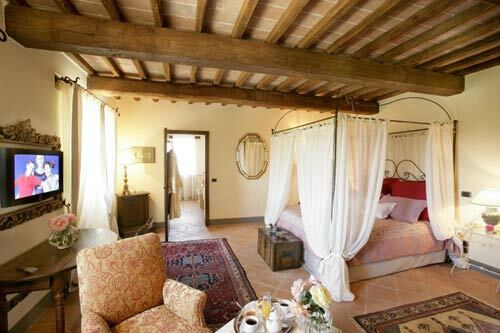 They have 8 rooms which are all beautifully decorated in a rustic, elegant style, mostly in ivory and earthy tones, with antique tiles and rugs on the floors. The standard and superior rooms have a nice bathroom with shower only (no tub). Only the suite in the dove tower has a bathroom with tub. 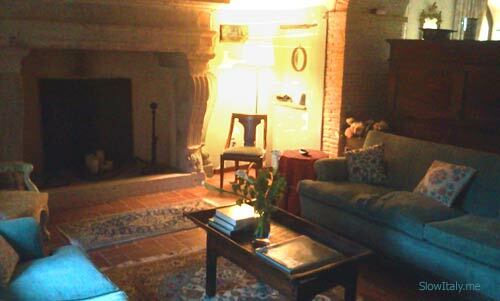 Downstairs there is also an honesty bar and a common sitting room, with a beautiful 1700s fireplace, where guests can relax. Sitting room. 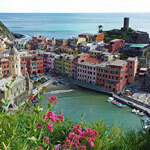 Photo: Slow Italy. The country house is a little isolated and has kept its tick original walls, which is the reason why there is no wi-fi signal in the rooms, but if really necessary you can connect with your own computer, or from the common computer, in one of the sitting rooms down stairs. Then again, everything in this place is designed and thought out to make you relax, so it would be a pity to come here and think about work! There is no restaurant or table d’hôte, but Leonardo knows some nice, little restaurants in the medieval hamlets nearby that are worth discovering. 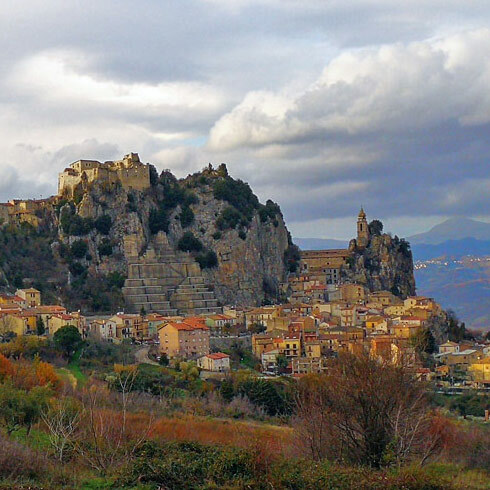 See Stroncone in 8 lovely Umbrian hilltop villages. 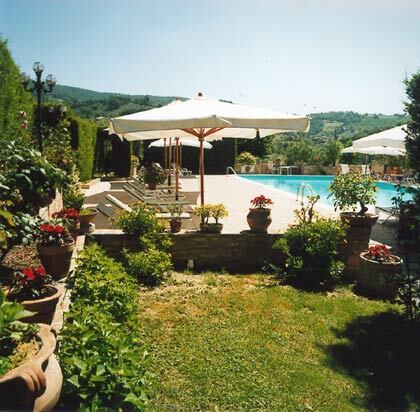 There is a lovely pool area with beautiful views over the valley and Narni. 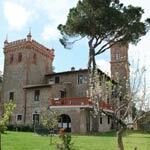 Torre Palombara is also ideally located to visit the Marmore falls and the Valnerina valley. Spoleto is at a 30min drive, while Todi, Spello, Montefalco and even Norcia are also within an easy drive. 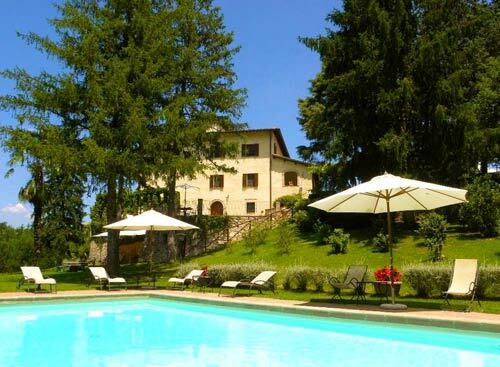 Palazzo Leti is the only one of the five country houses where we have not personally stayed, but the feedback we have received tells us that this one definitely deserves to be included in the list. 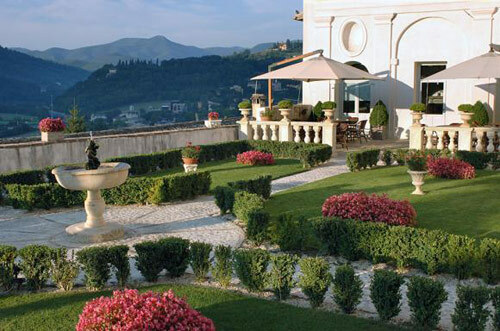 Located in Spoleto’s historic center, Palazzo Leti is an aristocratic mansion dating back to the 13th century. 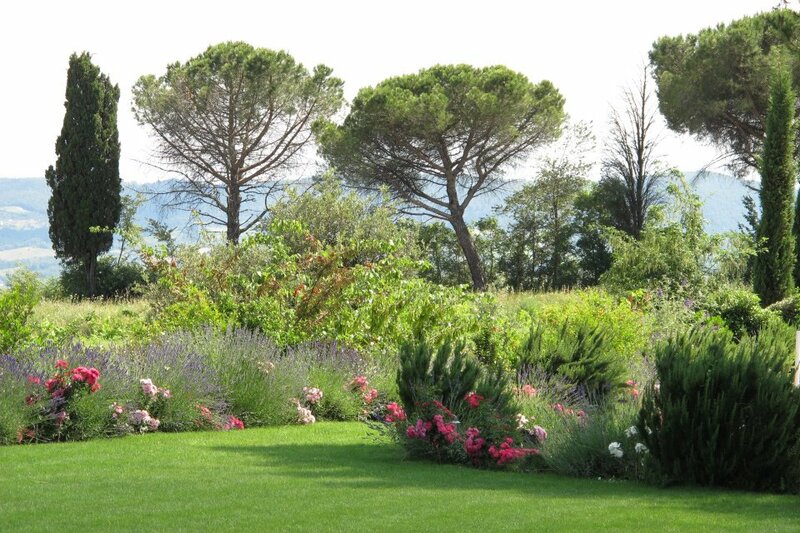 The beautiful landscaped gardens offer breath-taking views of the Rocca Albornoziana (fortress) and the Monteluco Valley. The house has been in the same, noble family for the last 300 years, and offers friendly and thoughtful service in a laid back atmosphere. Posti bellissimi come si puo prenotare una vacanza ? 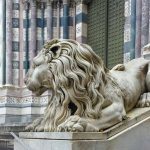 Si puo’ contattare il B&B usando il link in fondo ad ogni descrizione (vi ricordo che noi non facciamo pubblicità per questi B&B. I nostri sono giudizi completamente personali ed indipendenti).